Team a green floral biker jacket with light blue ripped skinny jeans to be both neat and relaxed. Bump up the cool of your ensemble by complementing it with Del Carlo ankle pumps from farfetch.com. For a cool-meets-incredibly chic ensemble, make a beige print dress shirt and a white print pencil skirt your outfit choice — these items play pretty good together. When it comes to footwear, this outfit is finished off really well with Del Carlo ankle pumps from farfetch.com. If you're all about relaxed dressing when it comes to fashion, you'll love this adorable combination of a black leather biker jacket and navy ripped skinny jeans. Bump up the cool of your look by completing it with Del Carlo ankle pumps. If you're on the hunt for a casual yet totaly chic ensemble, wear a navy fur collar coat and navy ripped boyfriend jeans. As well as very comfy, both pieces look great when worn together. 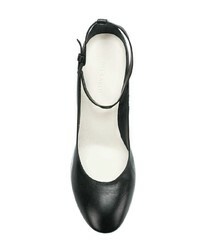 A pair of Del Carlo ankle pumps from farfetch.com will add some real flair to this ensemble. If you're on a mission for a casual yet seriously stylish ensemble, go for a tan poncho and black skinny jeans. These pieces are super comfy and they will also look great when worn together. Got bored with this ensemble? Enter black leather pumps to spice things up. If you're on a mission for a casual yet totaly chic ensemble, marry a tan blazer with navy dress pants. These items are totally comfy and they also look great when worn together. For shoes, make Del Carlo ankle pumps from farfetch.com your footwear choice. Make a black slit evening dress your outfit choice for a stylish and sophisticated look. When it comes to shoes, this outfit is complemented nicely with Del Carlo ankle pumps. If you're searching for a casual yet seriously stylish getup, marry a red knit turtleneck with a black skater skirt. As well as very comfortable, both of these pieces look great paired together. Got bored with this look? Enter Del Carlo ankle pumps from farfetch.com to shake things up. If you're after a casual yet incredibly stylish getup, consider teaming a white and black horizontal striped peplum top with black skinny pants. These two garments are super comfy and will look amazing together. Got bored with this getup? Enter Del Carlo ankle pumps from farfetch.com to switch things up.